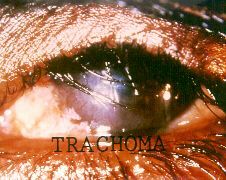 Trachoma is caused by the bacteria Chlamydia trachomatis. It is spread by direct contact with eye, nose, and throat secretions from affected individuals, or contact with objects, such as towels or washcloths, that have had similar contact with these secretions. The bacteria have an incubation period of 5 to 12 days, after which the affected individual experiences symptoms of conjunctivitis, or irritation similar to "pink eye". If not treated properly with oral antibiotics, the symptoms may escalate and cause blindness, which is the result of ulceration and consequent scarring of the cornea. Trachoma is one of the earliest recorded eye diseases. It is believed to have been identified as early as few years before 25th century B.C. It's the leading cause of blindness worldwide, up to this modern time. It afflicts over 800 million people in undeveloped countries such as Africa, Middle East, Southeast Asia, and Latin America. It frequently affects children, although the consequences of scarring may not be evident until later in life. It is preventable with adequate diet, proper sanitation, and education. Nowadays, trachoma is rare in the United States, Japan, and other developed countries. However, my latest reseaches indicate that many cases of trachoma have something to do with a certain negative energy existing in the world. It is the reason PYRO-ENERGEN has many abilities to help and assist for treating trachoma infection. We are receiving some reports from our friends in African countries. I remember during the WWII, that there were epidemic trachoma problem spread nearly in entire Japan land. It's during this time, Japan has poor economy situation and medical condition. This is the reason I brought this matter (trachoma) in this article. There were lack of medication and I also suffered from it when I was young. What my grandmother did for me was to wash my eyes with green tea. She made several litters of green tea everyday and told me to wash my eyes with it. I did it everyday for nearly 30 days. Thanks to green tea, my trachoma disappeared. I can remember the incident and the wisdom of my grandmother. Today, many parts in China still practice what I learned about green tea treatment from the wisdom of old folks. I recommended about the use of green tea to our friends and doctors in South Africa. 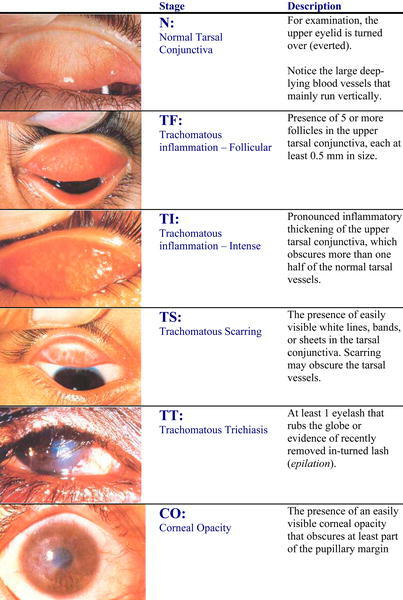 Remember, trachoma, should be treated early (with antibiotics, usually tetracycline drugs or sulfonamides). If left untreated, it can cause blindness. New research shows that a single dose of one antibiotic for treating "trichiasis" is more effective than a six-week regimen of another antibiotic. A single dose of "azithromycin" taken by mouth after trichiasis surgery reduces by one-third the recurrence of a vision-threatening eyelid condition called trichiasis. 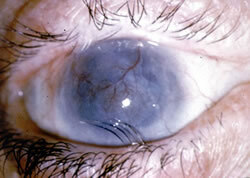 This maybe in contrast to the usual a month long regimen of tetracycline ointment applied directly to the eye. These findings may prevent future vision loss. Are your eyes healthy? Did you check your baby's eyes at your family clinic? I hope you are doing it often for your baby, because baby won't talk problems of eyesight. It is important to do eye examination before it's too late. An ounce of prevention for eye health is worth a pound of cure.